JAKARTA -- Cyclist Na Ah-reum became South Korea's first quadruple gold medalist of the 18th Asian Games on Friday. 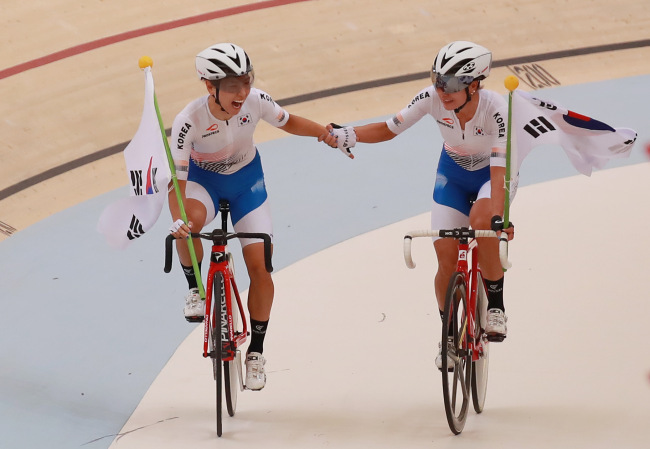 Na and Kim You-ri teamed up for 76 race points in the women's madison, beating Pang Yao and Yang Qianryu of Hong Kong by 15 points at the Jakarta International Velodrome. China finished third with 31 points. Na earlier won the individual road race and time trial on the road and picked up the women's team pursuit title on the track. Na is the first South Korean cyclist to win four gold medals at a single Asiad. The madison race is a relay event involving two riders per team. In the madison, the two riders alternate in the race and make switches when one feels the other is tired. The women's madison race covers 25 kilometers, or 100 laps on the 250-meter track. Teams earn points for being in the top four after every 10 laps: five points for first place, three for second place and so forth. They receive 20 bonus points for lapping another team.